Stuart Island is a favorite destination of ours with its marine state park, one room schoolhouse, and Turn Point Light Station where visitors often see pods of Orca whales. 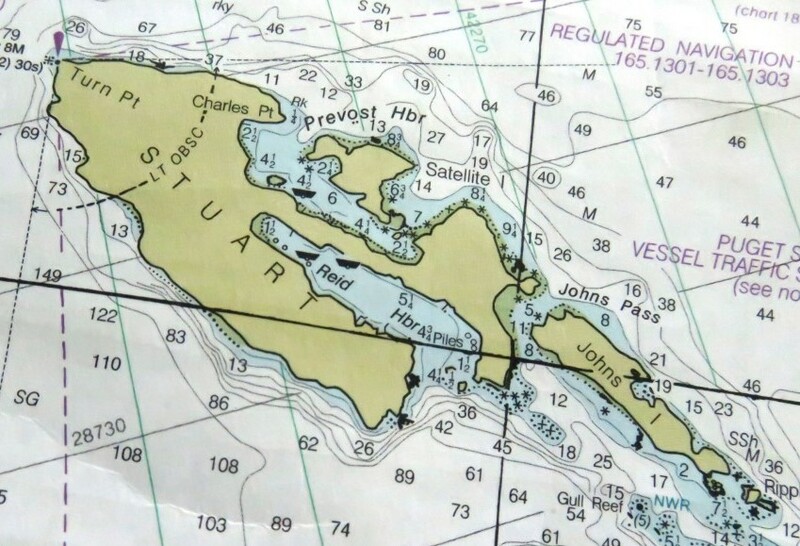 Two sheltered harbors give boaters safe anchorage, but we prefer Reid Harbor because we like to zip across Spieden Channel to Roche Harbor in our 10-ft. inflatable when the weather and current are favorable. Other boaters prefer picturesque Prevost Harbor, home to fun-filled Satellite Island. 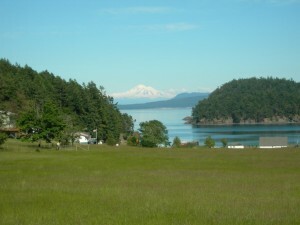 Camp Orkila on Orcas Island is owned by the YMCA of Greater Seattle and serves as a base camp for teen excursions to Satellite Island in the summer. 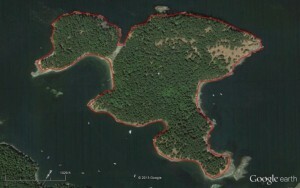 Four camps exist on the private 116-acre island located eight miles west across President Channel. Sunset Camp and Fellowship Camp on the western side are used for remote overnight camping trips. On the eastern side, Islander Camp is used by kayakers of the Islander Teen Expedition and Mariner Camp is used by sailors belonging to the Mariner Teen Expedition. The Islanders learn advanced boat handling, advanced navigation, and expedition planning skills before taking a four-week kayak trip through the San Juan Islands. Each participant is given an opportunity to lead their group as well as teach paddle skills to other campers on Satellite Island. To qualify for this adventure, a candidate must be able to perform a wet-exit and re-entry with their paddle partner. A solo time of rest and reflection completes the experience. 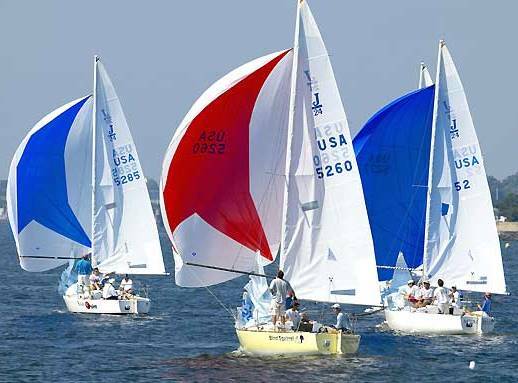 Likewise, the Mariners (grades 8-10) learn to read the wind and practice tacking and jibing before sailing around the San Juan Islands in J-24 or Soling sailboats. This group stays at Camp Orkila for the first and last nights of their trip. The first two days of their four-week trip day are spent sailing to and from a campsite on Satellite Island. 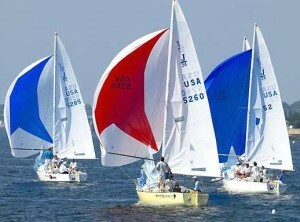 Soon they plan sailing trips with their instructors to camp on different islands. Satellite Island commemorates the H.M.S. Satellite, a British steamship surveying the San Juan Islands during the Pig War of 1859. 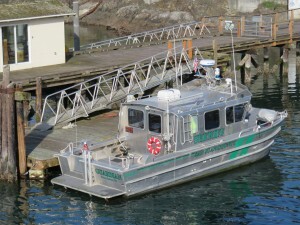 Stationed at Vancouver Island and captained by naval officer James Charles Prevost, it is no surprise Prevost Harbor and nearby Prevost Island, a Canadian Gulf Island, were named in his honor. But how did the Satellite Island reach camp status? In 1906, James M. Colman (who built Seattle’s original Colman Dock in 1882) began allowing YMCA camping at the family’s Agate Beach property on northwest Orcas Island. 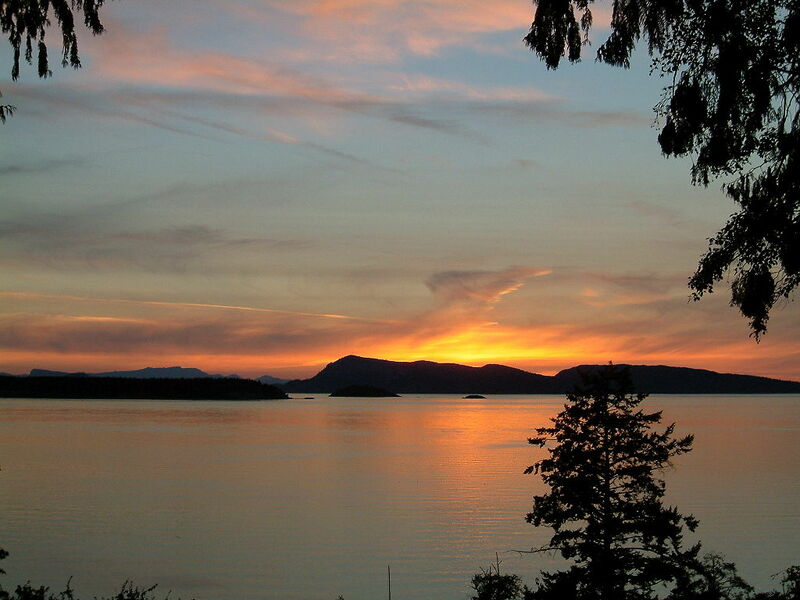 Six years later, Camp Colman was established on Case Inlet in Southern Puget. Then in 1938, the family deeded their 174-acre property on Orcas Island to the Y for a second permanent camp. 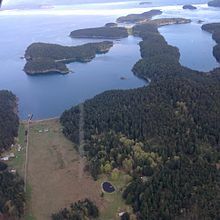 It was named Camp Orkila, a combination of Orcas and island, with the c changed to k to clarify pronunciation. Eventually, the Colman’s bought Satellite Island in 1947 for $10,000, logging it to recoup some of their investment before donating it for a Camp Orkila outpost. 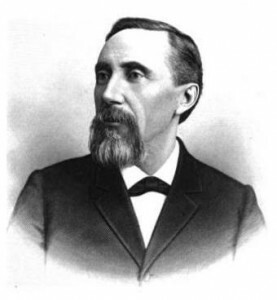 In the same year, Seattle shipbuilder, Robert Moran (founder of Rosario and donor of Moran State Park) gifted 10 acres at Twin Lakes for a second outpost. In 1974, the Y purchased the 190-acre Darvill farm adjacent to Camp Orkila, making it one of the largest YMCA camps in terms of size and amenities in the United States. Perhaps one of the most poignant stories I’ve read for this post is about former KING-TV chairwoman, Patsy Collins. 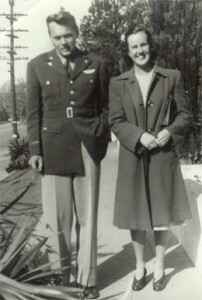 On her deathbed in 2003, the timber heiress gave up an engagement ring she’d cherished for 60 years after her fiancé Larry Norman, a bank clerk, died on a bombing mission over Germany before they could marry. His father, Charlie Norman, served as Camp Orkila’s director for 23 years and his mother worked as a staff nurse. “Sell the ring, Collins instructed, and use the money to send a few more kids to Camp Orkila in the San Juan Islands.” Instead of selling the ring, the camp directors chose to honor her request by raising an amount equal to the value of the modest ring to send kids to camp, enabling them to display her ring, a symbol of love, in the camp’s Larry Norman Lodge for future generations. Satellite Island offers campers intriguing coves to explore afloat and ashore. 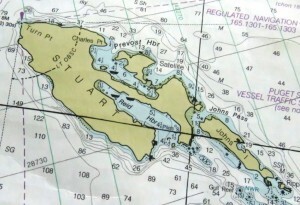 Due to the reefs lying southeast and southwest of the island, it is prudent for boaters to enter Prevost Harbor through its northern entrance. Douglas Fir trees, most 70-years-old, cloak the majority of the island, leaving clumps of Garry Oak clinging to the northern and southeast tips. Blue Camas, White “death” Camas, and Service Berry are familiar residents. In the photo below, two faults or fractures cross the island, one of them nearly dividing the island in half at high tide. Wildfire is difficult to extinguish, especially on an uninhabited island on a Sunday afternoon. July 25, 2010 proved to be that day! Sixteen firefighters from San Juan District 3, half of its force, worked until Monday morning to prevent the 4 to 12-acre blaze on the eastern side of Satellite Island from spreading. 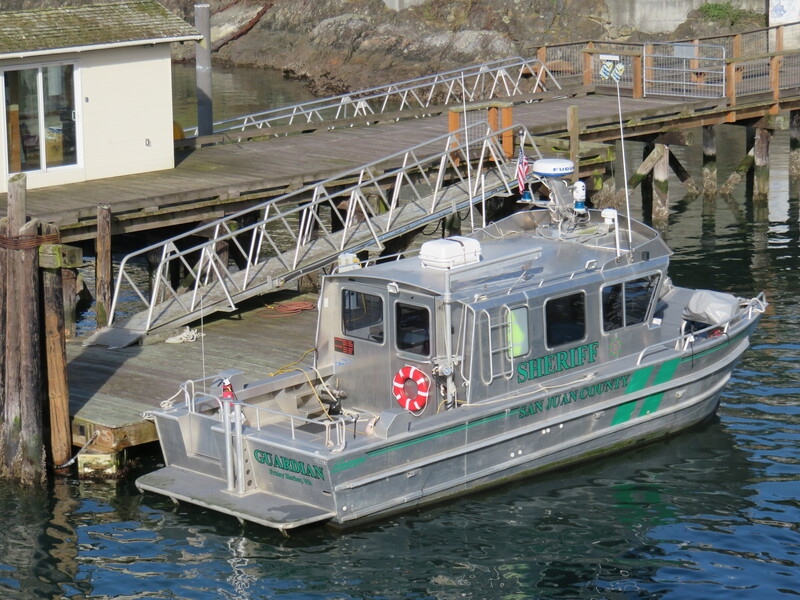 The sheriff’s boat Guardian, the Friday Harbor town fire boat Confidence, and a state parks landing craft made repeated trips to shuttle personnel and their equipment to the scene. The cause of the fire was unknown at the time of the incident. In April 2015, the YMCA received funding to hire the Northwest Natural Resource Group to develop a forest management plan to reduce the fire risk on the island in the future. This entry was posted in San Juan Islands, Satellite Island and tagged Camp Orkila, Deb Garland, Deb Garland's Scripture & Story, http://www.blog.debgarland.com, http://www.debgarland.com, James M. Colman, KING-TV, Moran State Park, Northwest Natural Resource Group, Orca Whales, Orcas Island, Patsy Collins, President Channel, Satellite Island, Satellite Island - Camp Orkila's Outpost, Turn Point Light Station, Twin Lakes, YMCA of Greater Seattle. Bookmark the permalink.